The modern reality is that when it comes to the road, bigger is safer and motorcycles are usually on the losing end of a collision. The National Highway Traffic and Safety Administration has reported that in 2015, motorcyclists were 29 times more likely to die in an accident than those riding in automobiles. In that year alone, nearly 5,000 people died in motorcycle accidents. The Los Angeles motorcycle injury attorneys at Ellis Injury Law Firm see the harrowing effects of motorcycle crashes each day while representing accident victims in California and therefore have a first-hand understanding of just how important it is to choose the right motorcycle helmet. These guidelines will help keep you riding safely. There are a lot of motorcycle designs and just as many choices in helmets. Safety dictates that your choice in helmet is suitable for the way you intend to ride. For example, if you plan on racing or riding for sport, you will need fuller coverage. 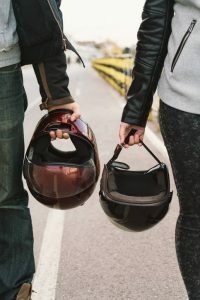 These helmets may also be safer for the daily commute, but the hassle of getting them on and off is likely to deter most people from wearing it regularly. A standard road-ready helmet is a better choice for daily use. Shop in a location where you can try the helmet on. If there is no local helmet shop, consider shopping at an online retailer with a generous return policy. Order several sizes and styles to increase the likelihood of achieving a good fit and return the rest. A helmet needs to fit your specific head shape so a mere measurement of circumference is not enough. When properly fitting, the helmet should offer full protection while not obstructing movement or vision. While wearing the helmet, make sure you can fully rotate your head and that you cannot roll the helmet off. Not all motorcycle helmets are created equal. In order to do their job, motorcycle helmets need to have solid construction. Federal safety standards call for a thick inner liner, sturdy chin straps, a solid weight, and no protrusions other than a visor. Helmets that meet the federal standards feature a sticker reading “DOT” on the outside back. Improved helmet safety standards and rigorous enforcement of California helmet laws both work to improve the safety of the road for motorcyclists. Unfortunately that does not change the physics involved when a massive SUV strikes a relatively unprotected motorcycle. Accidents happen and they can change the course of a rider’s life. For those cases, the dedicated personal injury lawyers at the Ellis Law Firm are here to help. We have an established track record of winning compensation on behalf of motorcycle accident victims in Los Angeles and throughout California. Call today for a free consultation – you never pay a legal fee unless we win money for you.